Whether you are handling electronics, food products or hazardous chemicals, finding the right cleanroom for your business is essential. Many businesses cannot afford thousands of dollars for a complete renovation of their facilities, or the hundreds of thousands of dollars it would take to purchase an entirely new facility. If you find yourself in need of additional space for an ISO 6 cleanroom or an ISO 7 cleanroom, you should consider purchasing a modular unit from Panel Built. While building a traditional cleanroom is possible, it can take more time and cost more money. In addition, these type of cleanrooms are less flexible and tend to require more upkeep than a modular unit. Because our products are designed to travel long distances for installation, they are often much more stable and secure than regular construction. We take steps to ensure that your cleanroom is designed and build to the highest possible standards, so you can begin working as quickly as possible. There are several benefits to purchasing modular cleanroom(s). Specifically, modular rooms are more economical, save time and reduce waste. Additionally you will benefit from less noise pollution and onsite construction. Purchasing wall systems for modular cleanrooms available online is a great idea if you are trying to save money. We are able to produce and ship your unit to you quickly. In addition to building your unit faster, our modular cleanrooms feature a hidden air system which eliminates the need for major duct work in your facility. A modular unit is constructed offsite which means you don’t have to worry about distracting your employees. This all but eliminates environmental impact on businesses or neighbors nearby and protects the environment from truck traffic and other debris. Because we are able to professionally construct your prefabricated non-metallic cleanrooms off site, we are better able to ensure that your product is completed in a timely manner. Additionally, most modular units last longer than brick and mortar construction. Panel Built works with qualified technicians who understand the strict standards set forth by OSHA. If you are wondering where to buy ISO 7 cleanroom online, check out Panel Built. We offer certified Class 1000 clean rooms up to Class 10,000 clean rooms. We work tirelessly to ensure that your product, staff and facility stay safe and meet industry regulations. When your business is operating on very little space, finding extra room for a cleanroom can be stressful. Because traditional construction is much more expensive, you can save money and hassle by researching a modular cleanroom mezzanine. A mezzanine structure allows you to access space in your existing facility that you are not already using. By building up, you create additional usable space in your facility. Our mezzanine structure surpass industry standards and are a perfect way for getting more room for your money. The installation of a mezzanine is relatively straightforward and will allow you to add additional space with a modular cleanroom. The mezzanine can allow for walking or storage underneath so you don’t have to worry about losing floor space. Once the mezzanine is constructed you can use your Panel Built modular cleanroom mezzanine without worry. Mezzanines are structurally sound and completely safe. The steel Mezzanines are designed to hold thousands of pounds, so you can rest assured that your staff and your product will remain away from contaminants in a secure location. ISO 6 cleanrooms that meet industry standards must meet a lot of requirements. Finding a unit that is less expensive than regular market and still meets or surpasses industry standards can be frustrating. 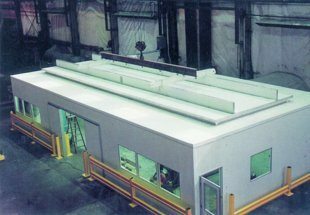 At Panel Built, we want our clients to get the best product possible, which is why we also offer prefabricated non-metallic cleanrooms. This provides additional protection for specific products and ensures you can get the best price no matter what type of cleanroom you need. 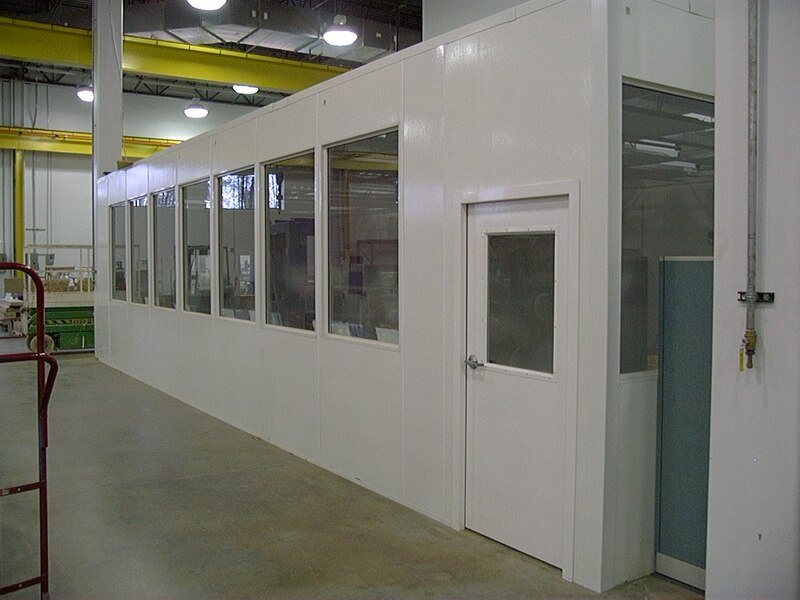 In addition to different levels and types of cleanrooms, we also offer wall systems for modular cleanrooms. The benefit of this is that your cleanrooms can stand alone. This not only saves you time and money, it makes the cleanrooms more secure against contaminants and air particles. While you are looking for cheap modular cleanrooms for sale, you want to find a product that is high quality and will arrive in a timely manner. As a business with years of experience, we understand the need to keep costs low. We offer high quality modular structures for much less than you will be able to build a traditional room. Additionally, this modular structures are designed to be taken apart and reassembled if necessary. This gives you much more flexibility in regards to moving to a new location or rearranging your work area if necessary. Modular construction is good for the environment and the pocketbook. We are able to limit our impact on the environment by creating and building your units in a central location. Additionally, we strive to use techniques that limit wasteful production. You can help reduce the amount of waste sent to landfills by choosing a modular unit. Modular units last longer and are easier to reuse or repurpose if necessary, this means less wasted material to fill our landfills. Whether you need an ISO 6 cleanroom or something with more protective power, we have what you need. Panel Built provides cleanrooms to all sectors in Class 1000, Class 10,000 and Class 100,000 levels. To learn more, contact Panel Built for details.